For those who like to check on their bets or receive updates on sporting events regularly, using the website isn’t always possible. Fortunately, Marathonbet has come up with mobile apps for Android as well as iOS users. The Marathonbet Mobile app for Android boasts of an uncomplicated layout and interface. This is particularly beneficial to users who may be unfamiliar with apps in general or might find gaming apps overly complicated. Though the live streaming feature is yet unavailable on its app, the amount of information that a gamer requires to place a bet is made available on the app through constant updates. The mobile app allows its users access to multiple markets. Information on future sporting events is also provided. The Marathonbet app is designed for ease of access, and it certainly lives up to its purpose. Step1: Go to the Settings menu of your phone and find the ‘Security’ option. Step2: After finding the option, select it and find the ‘Unknown Sources’ option. Step3: You need to enable this option as it allows apps from outside the Play Store to be downloaded on your phone. Step4: Go to the mobile site of Marathonbet. On opening it, you will find two options: Join Marathonbet and Download for Android. Step5: Before downloading the app, we suggest you register for it first. Step6: After completing the registration, click on the Download for Android option. This will start the download and installation process. Step7: Once this is complete, you are welcome to begin using the app. However, we would suggest that you disable the Unknown Sources option before that, lest you forget. The Marathonbet app for iPhone and iPad is as manageable and straightforward as the app for Android. Not only does the app have all the options that are offered by the Marathonbet site, but it also has some amazing features such as Quickbet. The iOS Marathonbet app is reliable and functions smoothly. Just like the Marathonbet Android app, iOS also gives real-time updates on live events to its users. This allows them to make their bets with complete information. It also provides players with odds on ongoing events. The Marathonbet App is a pleasure to use and is definitely one of the better apps available. With the number of choices available, you will not need to visit other gaming sites. Step 1:Visit your iTunes Apple Store and type Marathonbet App into the search box. Step 2:You will receive multiple options, find and choose the correct option. Step 3:In doing so, you will find the option to install. All you have to do is click on that option, and the Marathonbet App for iOS will begin to get downloaded onto your phone. Step 4:Wait for the installation process to complete itself. While you’re doing so, we suggest that you register yourself on Marathonbet through their website or mobile site. It is usually not possible for iPhone and iPad users to download apps directly from the source due to the device’s security software. To try and do so through other means can seriously compromise your phone or iPad’s safety. The mobile site version of Marathonbet is ideal for those who want to access the site through their phones but don’t want actually to download the app. Since the mobile site is able to adapt to the phone screen, it is much easier to access than merely opening the Marathonbet website on your phone. Like the apps, the mobile site version is quite basic which makes it simpler to use. It also has many features that allow players access to multiple markets and switch between sports quite easily. As on the app, users receive live updates on ongoing events as well as odds regarding each one, thus enabling them to participate in live betting. Marathonbet mobile sports betting is a lot of fun. Players can bet on a wide variety of sports such as Sumo, Basketball, Field Hockey, Football, and many others. Players can even bet on international leagues, which considerably increases the stakes. The number of markets that players can use is astounding, as there are multiple markets for each individual sport. The quick payouts also make Marathonbet a popular choice among betting app users. 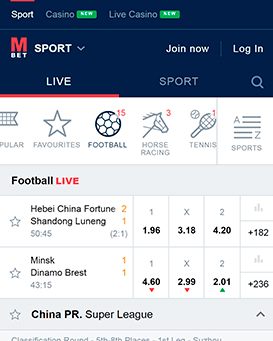 As we have mentioned earlier, live betting through the Marathonbet live app is exceedingly simple. Since players get regular real-time updates for ongoing events, it gives them plenty of information through which to place their bets. There is also a feature that informs players about upcoming events. The Marathonbet mobile casino app gives its users a number of casino games to play. Participants can play games such as Bingo, Baccarat, Roulette, Blackjack and many more. There are so many options offered in Marathonbet live casino app that we barely know where to begin. From Blackjack, Casino Hold ‘em, to Roulette, and Blackjack, there are a number of games that users can play live. This increases the stakes and makes playing far more thrilling. There aren’t too many differences between the mobile app and the mobile site version except in terms of layout. One major difference between the mobile app and the mobile site is that the latter offers a ‘Quick Bet’ feature that isn’t available in the Marathonbet Mobile app. While both versions have accessible layouts and allow their users to find their way around the site and app quite quickly, the convenience factor often differs. Sometimes, if you don’t have access to a computer and want to use Marathonbet, using the app is just more time saving and easier. However, the website, mobile site, as well as the app, have the same number of choices for their users. As of the moment, the app do not offers any Marathonbet bonuses and offers to its users. There is no a welcome bonus from this operator but you can follow the news on the website to know if there are new bonus offers. If you’re an Android user, make sure that the operating system of the smartphone you want to download the Marathonbet app on, is at least 4.2 or higher. Any version older than that will not be able to support the app. You can also check your phone for updates, as after updating your phone’s OS, you will be able to download and use the app. For iPhone and iPad device users, you need to make sure that your device has been updated or comes with an iOS version 8.1 or above. If they have an older iOS version, then you will have to update your phone before you are able to download the app. We hope this clears up a bit of your confusion and gives you a better idea of whether or not your phone can support the Marathonbet App. The Marathonbet mobile app is an online platform that allows interested parties to participate in online gambling. Marathonbet is a popular website that started over two decades ago and is an internationally recognised platform for online gaming and betting. People can bet on a number of sports such as Hockey, Golf, Football, Chess, Sumo, and Volleyball – our list could go on and on. Apart from sports betting, it also allows users to access other games such as Lotto, Casino, Live Casino, and Virtual Sports among many others. It gives users live information on games and sports events. The Marathonbet mobile app, as well as mobile site, gives its users all the perks that are available to website users. The bonuses also make a pretty good reason to use this site. What are all the things I can play on through the Marathonbet mobile app? There are a number of things you can play and bet on. From Live Casino, Bingo, Sports, Live Betting, you won’t have a shortage of options. Does the Marathonbet mobile app have live streaming? Do users receive any bonuses for joining the Marathonbet Mobile App? Yes, users can receive multiple bonuses for joining the app. If I want to withdraw money from my account, is there a limit on that? Most payment methods like Skrill, Neteller, Bank Transfer have a minimum withdrawal and deposit limit of £5. Does Marathonbet have a ‘Cash Out’ option? How do I know if my phone meets the Marathonbet app’s system requirements? It is easy to check if your phone meets the system requirements of the app. All you have to do is find out which version of the operating system your phone is currently using and see if it is 4.1 or a later version for Android and 8.1 or a later version for iOS. Does Marathonbet allow betting on horse races? Yes, it does. In fact, this is a popular option for our customers and we provide real-time updates on ongoing races. Are there any live games? Yes, it does. Through the Marathonbet app as well as the website, users can participate in Live Casino and Live Betting. Each of these lets users participate in and bet on many live games and sports. The Marathonbet app, website, and mobile version have a lot going for it. From the sheer number of options to the easy to navigate layout, it is visible what makes this app so popular. There are many game tables, markets, and sports – in short, plenty to keep customers happy and occupied. The app is smart, reliable, as well as fast. Though the website could use some revamping, it’s simplicity is also one of its selling points. The only problem the website and the app have is the lack of streaming services. While the quick and constant updates on races and other sporting events do make up for this to a degree, live streaming has become an essential tool in most apps. However, this is the only flaw we could find. We give the app an 8 out of 10 because of its reliability and amazing set of options.